How to copy the Crystal Constellation cardigan worn by Michelle Obama at the G20 summit. Cast your minds back to last April, or rather the momentous to-do that was the G20 summit. On that dramatic occasion the IMF dipped deep into their pockets and pulled out $1tn to solve the global economic crisis, violent protests lined the streets resulting in a fatality … and Michelle Obama wore THAT cardigan. Yet another of her fashion triumphs, the G20’s political fallout might be yesterday’s news, but her champagne cardigan and pencil skirt combo still receives media attention as a key look. The J-Crew Crystal Constellation cardigan especially proved such a shining example to fashionistas that it sold out soon after the event, despite the not-so-peachy $298 price tag. Expensive, exclusive and elusive as it may seem, if it’s any constellation (see what I did there!?) you can make your own for a fraction of the price. 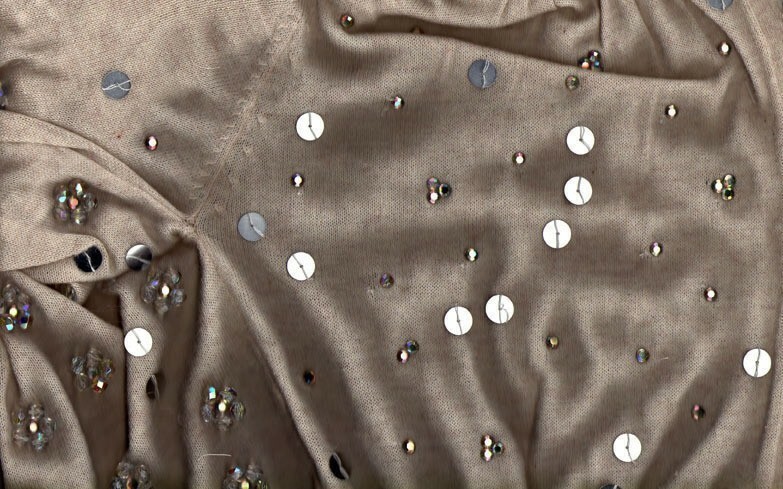 Look at the detailing close up on the cardigan and you’ll see it’s crystal constellation by name and by nature as it sparkles with crystals and glass beads in star clusters, framed by patterns of circular silver sequins. 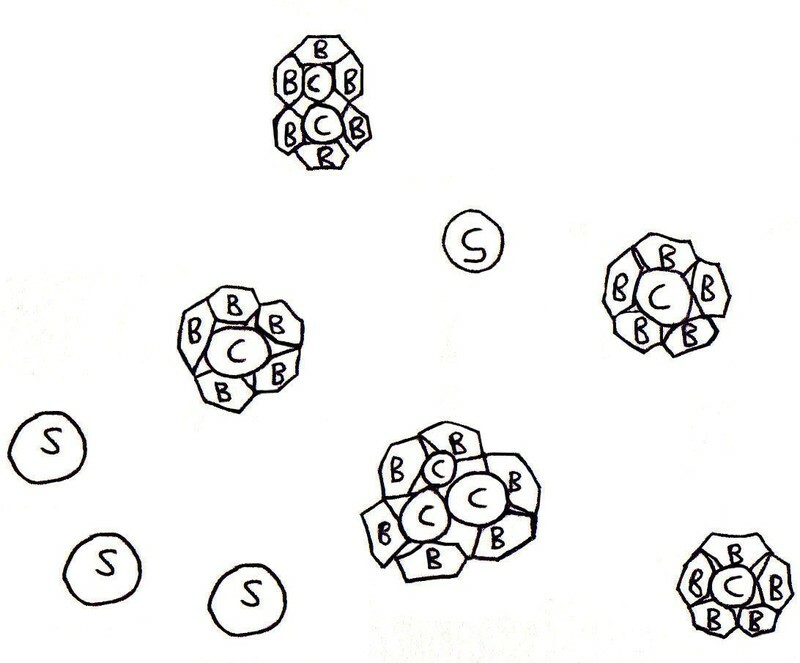 Here's a diagram of the patterns of sequins, crystals and crystal beads. The First step is to dot the sequins reasonably sparsely all over the garment. 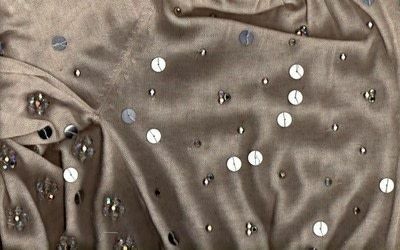 You might also notice that some of the sequins are sewn closely together in short arcs, which you might want to include to get an authentic look. Strengthen your stitching by sewing with your thread double thickness and stitch from the centre of the sequin outwards. Then do the same stitch from the centre towards the opposite side of the sequin to the one before. Next step – the crystals: Before gluing them on, make sure you have something between the two sides of the garment, say a magazine between the front and back panel or a plastic bag stuffed down the sleeves, to stop the fabric glue from seeping through both layers. 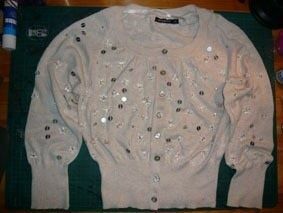 Dot the crystals as generously around the cardigan as possible and secure them with fabric glue. My advice would be to apply the glue to the fabric first and then place down the crystals as it is less messy and fiddly that way. Final stage is to stitch your glass beads around the crystals in clusters to match the ones on Michelle Obama’s cardigan. As you can see in the diagram, you will need 5 beads to surround each single stone or about 6 to surround clusters of 2 or 3. Ooh sorry about that little omission... I used silver sequins. im totally doing this! great job! but i wished u had a bigger picture of you and your lovely cardi! what are the colours of the sequins that u used?? ?